Web hosting company 1&1 internet have announced that it has removed its traffic caps from all of its products – meaning that those Digg and SlashDot hits should be enjoyed and not feared for thousands of website owners. People can find themselves having to fork out when their websites get spikes of traffic, but 1&1 has come to the conclusion that it should not be penalising people and removed all of its traffic limits. "From today, an unlimited volume of data is available for page impressions, downloads and uploads of files for all 1&1 hosting packages," announced 1&1. 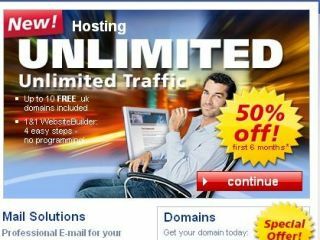 The company is working hard to get people setting up websites, increasing web space quotas and dropping prices. For instance, The Home package is now available from just under £3 a month and brings with it 5GB of web space.